CarGurus has 3,269 nationwide Accord Coupe listings starting at $1,990. Personal luxury is a concept that sometimes feels lost in the age of carpooling and ride-sharing. 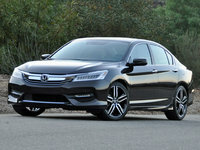 But while cars like the Acura Integra or Cadillac Eldorado have gone the way of the Dodo, the Honda Accord Coupe continues to deliver a stylish, well-equipped package that focuses on those in the front seat. Though the Accord Coupe no longer shares any body panels with its four-door sedan, they were both redesigned in 2013 and are now freshened by updates for the 2016 model year. New additions include added chrome in the front grille and rear details and more aggressive LED headlights. The Accord Coupe comes in 5 trims: LX-S, EX, EX-L, EX-L V6, and Touring. All trims up to the EX-L V6 get crisp, rakish headlights, while the range-topping Touring model features futuristic LED headlight assemblies. The LED units are polarizing, to say the least--the units in the non-Touring models are far more fetching. The cabin in 2016 models may look unchanged to the untrained eye, and the overall shape does remain the same. But there are key updates where it counts, namely in the center stack. Honda previously featured a combination touch screen and dial control setup that was overly confusing and could even prove dangerously distracting. Perhaps the company spent a little more time figuring out exactly how humans interact with these interfaces, as it eventually swapped the two-toggle setup for a single touch screen that also controls a non-touch top screen. This sounds completed, but it's more intuitive than you might think. Most notably, the touch screen now supports Apple CarPlay and Android Auto, two hotly anticipated user interfaces that allow you to take advantage of many of your smartphone’s features through a familiar smartphone interface rather than the automaker’s proprietary system. You can use the phone’s own native maps app even if the car itself does not come with navigation! You can also send and receive calls and text messages. and access streaming music apps like Pandora or Spotify. Overall, it makes for an extremely personalized infotainment experience in your car. Features like Bluetooth connectivity with voice recognition, speed-sensitive radio volume, an auxiliary audio jack, and a USB port all come standard. Opt for the uprated Touring edition and a satellite-linked navigation system with realtime weather and traffic updates comes standard, as does a Song by Voice system that lets you select music simply by saying the song title. The base engine for the Accord Coupe is a 2.4-liter 4-cylinder, sending 185 horsepower to the front wheels through either a 6-speed manual or a continuously variable transmission (CVT). The Touring and EX-L V6 come with a powerful 3.5-liter V6 engine, sending 278 hp to the front wheels through either a 6-speed manual or 6-speed automatic transmission. V6 models with the automatic feature Variable Cylinder Management, which shuts off 3 of the 6 cylinders when peak power is not needed, ultimately saving fuel. EPA fuel economy estimates for the 2016 Honda Accord Coupe with the 4-cylinder engine and CVT come in at 26 mpg city/35 highway. Opt for the 6-speed manual and fuel economy drops to 23/34. The V6 paired with the 6-speed automatic transmission achieves fuel economy of 21/32. The Accord coupe comes with a comprehensive array of standard and available safety features, including front- and side-impact airbags and a multi-angle rear-view camera with dynamic guidelines. Available on most models and standard on the Touring is Honda Sense, a suite of high-tech advanced safety features like Lane Departure Warning, Collision Mitigation Braking System, and Road Departure Mitigation. The latter uses a front-mounted camera to identify the lines in the road as well as other obstacles and road markers in order to determine the path of the highway. It will then warn you and even provide corrective steering if the car veers out of the lane. Base MSRP for the 2016 Honda Accord Coupe is $23,775 for an LX-S, while an EX model starts at $25,900. An EX-L, which is an EX with leather and some other creature comforts, starts at $28,745, while an EX-L V6 starts at $30,925. The range topping Touring model has an MSRP of $34,925. In a world where we are often asked to downsize or cut back, the Honda Accord Coupe offers both a spacious interior and the piece of mind that comes with driving a car as big on fuel economy as it is on cutting edge technology. 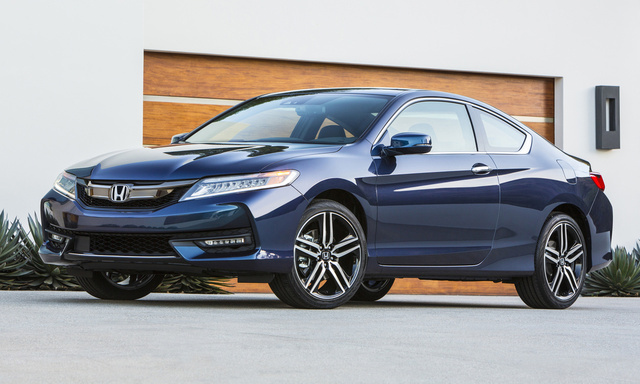 What's your take on the 2016 Honda Accord Coupe? Guru5JVZN Great car! 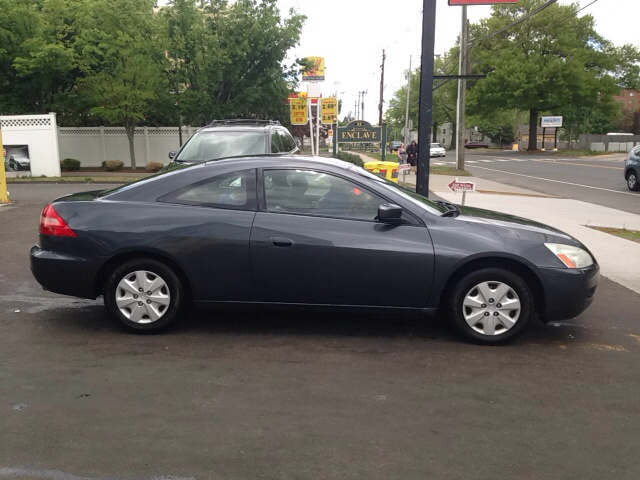 Looks good, drives good, and gas mileage is awesome! Users ranked 2016 Honda Accord Coupe against other cars which they drove/owned. Each ranking was based on 9 categories. Here is the summary of top rankings. Have you driven a 2016 Honda Accord Coupe? I want to get out of my lease by selling a very good car. This one is not big enough for me any longer. It's a 2016' V6 with manual transmission, and low mileage. All I want is an Accord 4 door sedan with some type of a white body, camel interior, V6, automatic transmission, and NO MOON ROOF!